I’ve been busy getting ready for my Mother’s Day sale. I had a lot of fun making some of my old stand-bys like Tangerine Spice and Spearmint French Green Clay. But I also played around with a new scents. A lot of my customers are Patchouli fans and up until now I’ve only made one: Green Goddess. 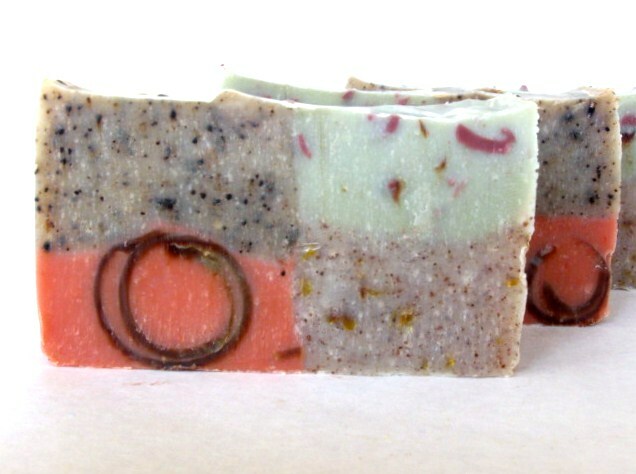 This time I made a new one called Patchouli Sunrise with Patchouli, Orange, Cedarwood, Eucalyptus and Lavender Essential oils. I also played around with a new four square technique. I was inspired by some really beautiful soap. I’m a bit of a perfectionist when it comes to my soap and I’m both happy with how they turned out while still seeing room to improve on the technique. 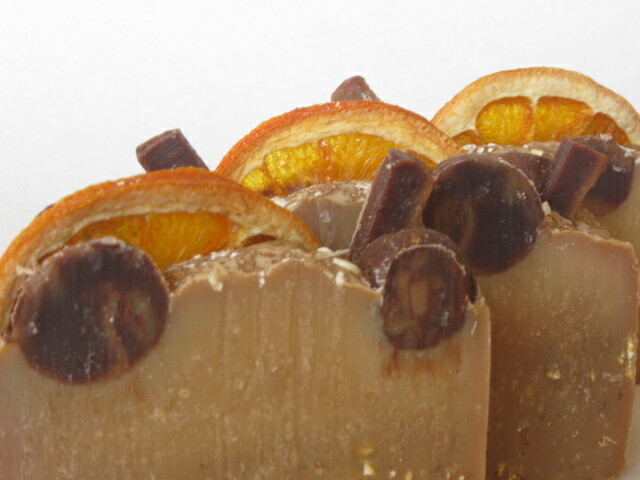 Chocolate Orange: Nutmeg, Oats, Calendula, dried Oranges, Dark Chocolate, Orange Essential Oil and Chocolate Fragrance Oil. 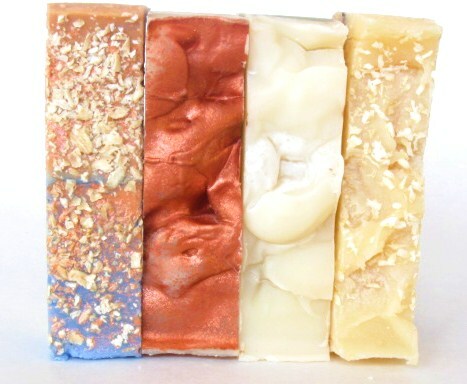 From left to right: Patchouli Sunrise, Tangerine Spice, Spearmint French Green Clay, Coconut Lemongrass. 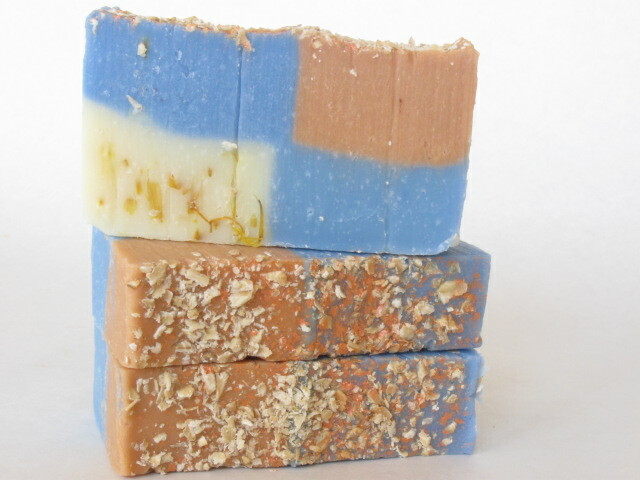 Patchouli Sunrise: Calendula, Oats, Apricot Mica, Moroccan Red Clay and Blue Pigment with essential oils of Patchouli, Orange, Eucalyptus, Lavender and Cedarwood. Rusticity: Coffee, Apricot Kernel Meal, Calendula, Dark Chocolate, French Pink Clay, French Green Clay and essential oils of Pink Grapefruit, Cedarwood and Tea Tree. 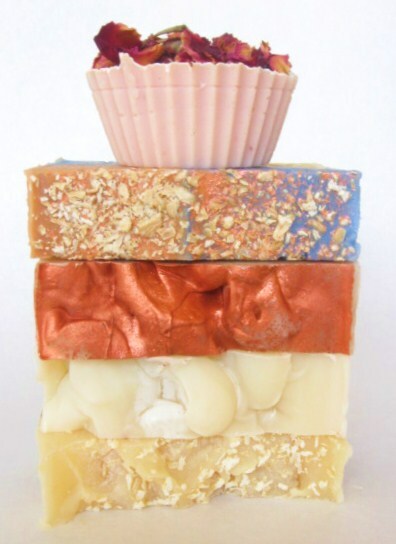 From top to bottom: Bed of Roses,Patchouli Sunrise, Spearmint French Green Clay, and Coconut Lemongrass.